Engaging courses are easy to build with Articulate Storyline. Choose from a wide variety of slide types and even import slides from other sources. When the Insert Slides window appears, click a category on the left, then choose a slide type on the right. Templates: Take advantage of templates to save time. 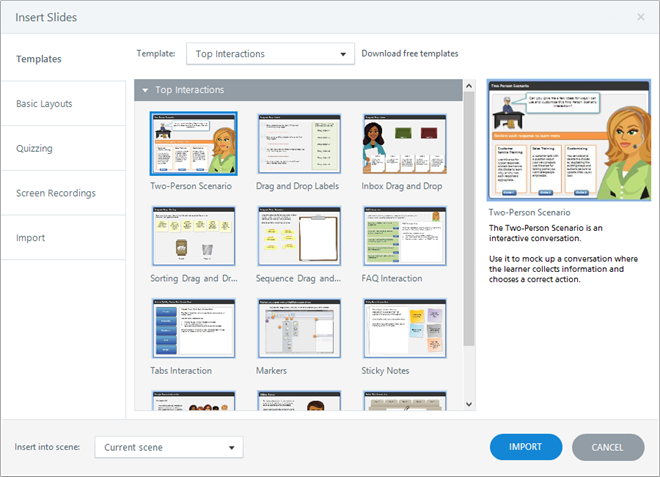 Storyline has a library of ready-made templates for e-learning scenarios. Just select a template, then customize its content. You can add more templates to your Storyline library by downloading free templates from the Articulate community, collecting them from other course developers, or creating your own. Basic Layouts: Storyline has several common slide layouts for titles, text, and media. They're based on your design theme and slide masters. You can customize layouts and add new ones. Quizzing: Choose from a gallery of form-based questions and freeform interactions. You can also draw existing slides from question banks. To give learners feedback and track their scores, add a result slide. Screen Recordings: Record your screen, then insert the screencast into your course in a variety of formats. Screencasts are great for software simulations and workflow demonstrations. You can insert them as videos or as interactive step-by-step slides. Import: Leverage existing content by importing slides from Microsoft PowerPoint presentations, Articulate Quizmaker quizzes, Articulate Engage interactions, and other Storyline projects.